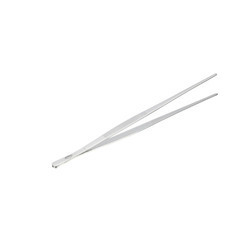 Seafood tools type: fish bone tweezers, Makes de-boning fish easier. Portable, can be used at home, picnics and more.Smooth surfaces eliminate areas that collect dirt and bacteria. Stainless Steel will resist corrosion in damp environments.Let you remove fish bones quickly and safely without mess. Easy to use pincer style tongs. Premium Quality Material: NJ Kitchen tweezers is made of sturdy and high quality stainless steel, durable and easy to clean. High hardness & toughness, not easy to deformation when strong grip items. Multi-purpose: This cooking tweezers overall thickening, has 3 specifications, such as straight head, gun shape, elbow tweezers to meet more requirements for use. Especially for small objects, curved forceps like a gun shape will save energy, so applicable widely. Security Tools: The special plastic protective cover can protect effectively the plating tweezers head, also for convenient storage, prevent accidental puncture; non-slip grooves can safely grab some things without slipping. Use a comfortable handle, tweezers to protect your movements. 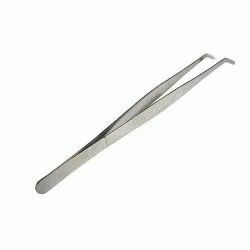 The tweezers have good elasticity when grab, and the inner toothed design makes it easy to clamp the items and not slip; the clamping gap is small, and can grab the small items such as hair easily. 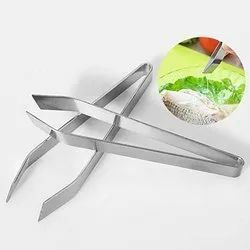 KITCHEN ASSISTANT - These Stainless steel Kitchen Tweezer food tongs have almost surgical Precision good for getting to those fish bones.Some have called it keys to the kitchen or even a key kitchen gadget. Also can be used for crafts and fun. And yes, it is a cute kitchen utensil. PERFECT - When you purchase this Specialty Stainless Steel Kitchen tweezers & Surgical Tweezer Food Tongs,I'm sure your home kitchen cookware will feel more complete with this Specialty Stainless Steel plating tweezers & Surgical Tweezer Food Tweezers Tool. We are offering Bar Tweezers to our clients. They can avail this item from us at a reasonable arte. Multifunction use, not only use at cooking, but also use on feeding, plating or handling subtle food or other items. Looking for Kitchen Tweezers ?